Drugstore, department store, or speciality store, I’ve certainly tried my fair share of mascaras over the years. In my opinion, mascara is a product that can really make your look: what’s a smoky eye without lush, voluminous lashes? It’s also an integral part of my “3 step process” for when I don’t have enough time to apply a full face of makeup: 1. apply under-eye concealer, 2. curl lashes and apply mascara, 3. apply tinted lip balm. Fun fact? Egyptians were the first people to use mascara, where both men and women darkened their lashes in an effort to protect their eyes from the desert sun, and ward off evil spirits (after all, the eyes are the window to one’s soul). Luckily, the formulation and wear of mascara has changed quite a bit since then (honey, dung, and water were the Egyptian’s concoction), and I’ve put together a list of my top 3 modern-day favourites. 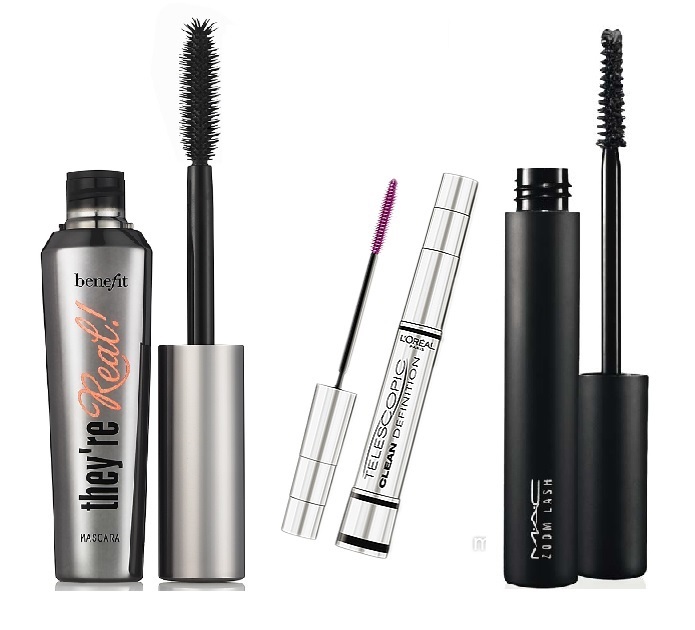 Whether you’re looking to spend a little or a “little-more”, any of the mascaras below are sure to cause bouts of lash-batting and selfie-taking. Ready? I originally purchased this product as an impulse-buy at the L’Oreal private sale, and was pleasantly surprised when it turned out to be one of my all-time favourite mascaras. The thin, comb-like brush separates and coats lashes without clumping, and the fragrance free/ophthalmologist-tested formula is suitable for sensitive eyes and washes off easily at the end of the day. If you’re looking for extra length, and an extra-wallet friendly deal, definitely give this mascara a try. Learn more about the L’Oreal Telescopic line here, and purchase it from stores such as Wal-Mart, Target, and Shoppers Drug Mart, or online at well.ca. I’ve been a fan of Mac Cosmetics for a long time. Their products are of professional quality, and there’s always a great mix of “fun” and practical goodies to try. One of my go-to repurchases is their Zoom Lash Mascara, which has a fibre-wand that multiplies the look of lashes (while also elongating) and coats them in a shiny, gel-like formula. One coat is enough, but you can definitely build coats for more drama without worrying about clumping or caking. If you want lashes to look bolder and thicker, then allow me to introduce you to your new best friend. Purchase it in-store, or on the Mac website here. I can’t help but laugh whenever I wear this mascara and someone asks me if I’m sporting fake lashes; I’m sure Benefit would be happy to hear that the name they chose definitely holds true to their product! The perfect combination of separation, length. and volume make this product worth every penny. For application, you’ll want to stop after 1 or 2 coats to avoid caking (you really won’t need any more). If I’m looking to revitalize my lashes before going out at night, I’ll simply re-curl them instead of applying more product. For removal, you’ll want to use some sort of eye makeup remover (soap and water aren’t enough to wash this beauty away). If you’re thinking that $29.00 is too much for anyone to spend on a tube of mascara, you’re probably on the same boat that I was before I tried it. My recommendation is to jump-ship, skip a few daily lattes, search your couch for spare change, and start saving for this holy-grail product. You’ll thank me later.